Before we left for Disney my son told my mother that he wished she could come too. She told him to make a wish when he got to the castle and that sometimes dreams do come true. This morning while sitting out at the pool watching my husband and son swimming. I caught my husband making a funny face in the direction behind me. I turned and this is what I saw. That is my Mom and sister! Needless to say I was speechless and immediately began to cry. They flew in last night and they will be at the finish line. Way back when I started this journey I had fleeting thoughts about how incredible it would be to have my family see me cross the finish line, but Florida is not exactly close by. In the end I will have quite a cheering squad when I finally finish my very first marathon tomorrow. My husband, son, mother, sister, father, father’s girlfriend, one of my dearest friends, her husband and their daughter will be cheering for me! I feel so blessed to be surrounded by family today. So I guess sometimes wishes do come true. The Disney Marathon supports the Leukemia & Lymphoma Society. I will be running this in honor of someone special at home who is fighting a courageous fight against leukemia. My thoughts, prayers and wishes are with her. For her I will cross that finish line. AMAZING, that is awesome. 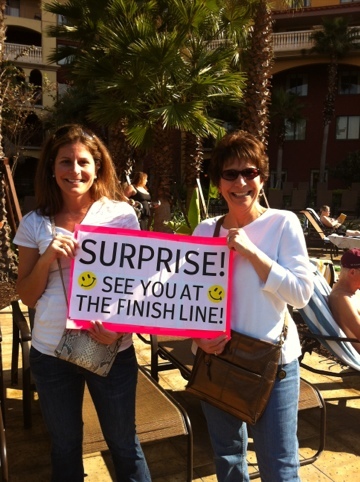 What a great way celebration for your first marathon. Awesome mental fuel for your run. Yay, that’s awesome that they surprised you and made the trip down there! You’re going to do amazing Aimee! What an amazing surprise!!! I’m sure you did fabulous today!! Congrats!! OMG, I got teary just reading this post!! SO EXCITED!! Hi Aimee! I can’t wait to hear all about it! You have so much love and support behind you. What a wonderful thing you’re doing for yourself. Aimee! I’m so glad this wish came true! What an awesome surprise 🙂 I can’t wait to hear all about your exciting times at Disney.